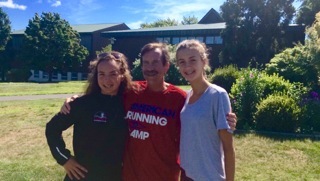 PRC is so proud to support the running community by offering young runners scholarships to the American Running Camp in Walter’s memory. We call these young athletes Walter’s Gang. To date, a total of 99 young runners have received American Running Camp scholarships from the Walter Burgess Scholarship Fund. We would like to introduce you to recent camp scholarship recipients and tell you a little about them. Please take a moment to read the many thank you notes we received from some of our happy campers. Thank you so much for the Scholarship to the American Running Camp! I had a blast while becoming a much better runner and athlete. Many of the coaches and counselors at the camp were friendly and encouraging, as were the other campers I talked to. We had many interesting and inspiring lectures, some about stories of great runners, and some on how to prevent injury. Maybe the best part of all this was the food. It was very tasty, and I had many different foods to choose from each day. I became a better runner, cutting my 5K time from 29:31 to 26:18 on a hilly course! We were also divided into “Competition Groups”. We did different activities with your group throughout the week, slowly earning points to try to beat the other groups and win prizes. This encouraged teamwork and friendly competition. My group won, making the camp all the better for me. Again, thank you for the scholarship, as it was generous and created an opportunity for me to enjoy and learn, as Walter once did, from the American Running Camp.